With over 60 years of experience in the industry, affordable pricing, timely completion and convenient location in Pran Central Shopping Centre, Red Square Shoe Repair is the number one destination for anyone in the region in need of watch repair. Watches are incredibly handy devices, both in a figurative and literal sense, and many find themselves checking their watches every 5 minutes or more. When such a timeless timekeeping device stops working, it deserves a timely watch repair. Watch bands are the most common source of woe for watch owners. We can adjust or replace worn, broken or wrongly sized bands within minutes, with a sizable range of new bands to choose from. Nothing lasts forever, although watch batteries can come close. When the inevitable time comes, however, we can replace your battery and breathe new life into your watch. Spent batteries can be dangerous, and battery disposal centres aren’t convenient to get to nearby. Save yourself the hassle and set your mind at ease by letting us safely dispose of your old batteries for you. Our cleaning techniques will make your watch face and body as good as new. Our services aren’t limited to the specific ones listed above. 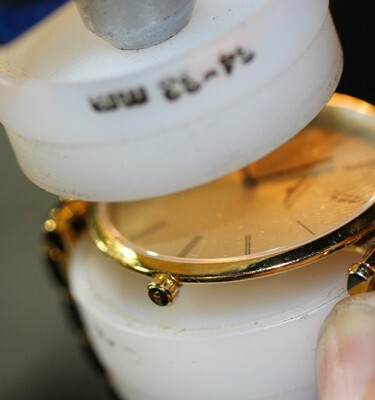 If your watch needs a repair that isn’t covered by one of the above, bring it in and we’ll see what we can do. Watch repair is a fast, convenient way to fix problems with a watch or get batteries replaced.